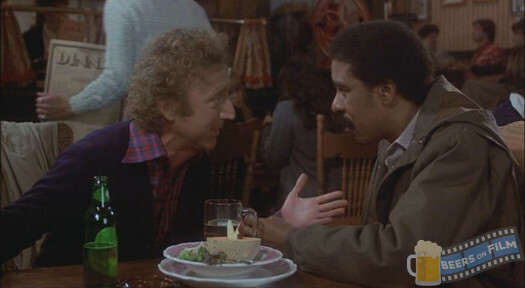 Gene Wilder and Richard Pryor weren’t really a comedy team at all, just two incredibly funny comic actors who happened to work well together. Both were stars in their own right, first appearing together in the 1976 comedy-thriller SILVER STREAK, with Pryor in the pivotal supporting role as a thief who aides the in-danger Wilder. Audiences loved the chemistry between the two, and of course Hollywood took notice. 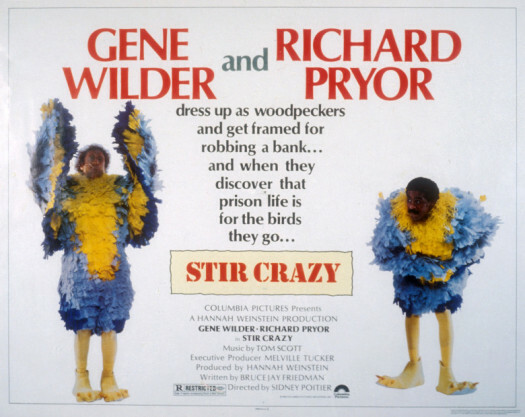 STIR CRAZY is not a sequel, but a funny film of its own allowing Gene and Richard to be their loveably loony selves. He is a private detective, the latest in a long line of gumshoes. While Harry’s father and his grandfather may have been great detectives, Harry is about as incompetent as can be. He is a self-styled master of disguise but not much else. He is employed at Crumb & Crumb Detective Agency, solely because of his family background. When the head of the agency, Eliot Draisen (Jeffrey Jones), engineers the kidnapping of a millionaire’s daughter, he gives the case to Harry because he knows Harry will never be able to solve it. He is John Candy, the much beloved and much missed comedic actor from Canada. As anyone who has ever seen an old episode of SCTV knows, John Candy could be one of the funniest men alive but Hollywood rarely knew what to do with him. Other than the movies that he made with John Hughes, Candy was always stuck in either supporting roles or in bad comedies. In Art Linson’s A Pound of Flesh, veteran film producer Linson writes that, because of Candy’s size, some Paramount executives wanted to cast him as Al Capone in The Untouchables. That is something that I would have enjoyed seeing. Instead, some actor named Robert De Niro got that role and Candy ended up making movies like Who’s Harry Crumb? Who’s Harry Crumb? tries to be a mix of comedy and mystery but, due to a weak script and uncertain direction, it does not really succeed as either. John Candy delivers a few laughs because he was a naturally funny actor but, as a character, Harry Crumb is not that interesting. Instead, the film is stolen by Annie Potts, playing a duplicitous femme fatale. Potts and Candy previously came close to working together in the original Ghostbusters. (Candy pulled out of the role of Louis Tully so that he could play Tom Hanks’s brother in Splash. He was replaced by his SCTV co-star, Rick Moranis.) The rest of the cast seems bored and uninterested in what they are doing. Even Jeffrey Jones, usually so reliable in smarmy bad guy roles, seems bored. John Candy died just 5 years after the release of Who’s Harry Crumb?, leaving behind two intriguing dream projects, one a biopic of Fatty Arbuckle and another an adaptation of A Confederacy of Dunces. Sadly, Hollywood never really figured out what to do with this talented comedian. I love my home state of Texas and I love movies. Therefore, it has always upset me that most movies set in Texas get the state totally wrong. That’s not exactly shocking. Unlike the rest of the states, there’s actually a lot of variety to Texas. We’re a big state and we’re home to a lot of people. Unlike some place like Vermont, Texas is a world all its own and it’s not surprising that most outsiders are incapable of getting their mind around that and instead find themselves embracing simple-minded clichés and stereotypes. That’s perhaps why the best films about Texas tend to be ones that were actually made by Texans. If you want to see the real Texas — flaws and all — than I suggest watching the films of Richard Linklater or perhaps Wes Anderson’s Rushmore. And yet, it took two outsiders to write, produce, and direct one of the best films ever made about Texas. The 2007 best picture winner No Country For Old Men was largely the work of two brothers from Minnesota, Joel and Ethan Coen. It’s not only one of the best films about my home state but it’s also one of the best films of the past decade. Based on a novel by Cormac McCarthy, No Country For Old Men tells the story of three determined men in South Texas whose lives are interconnected despite the fact that three of them spend almost the entire movie one step behind each other. In fact, despite a few brief encounters where their paths meet, it can be argued that, at no point, do any of them truly interact with each other face-to-face. Llewelyn Moss (Josh Brolin) is the type of person that anyone who has ever lived in Texas will have met. He’s a hard-working, plain-spoken man, the type who drives a pickup, owns a gun, and likes to begin and end the day with a beer. He lives in a trailer with his wife, Carla Jean (Kelly MacDonald, who may be Scottish but speaks here with an almost flawless Texas accent). Llewelyn’s not a bad guy but he’s not as smart as he thinks and, like a lot of folks down here, he doesn’t like the idea of being told what to do. In fact, he’d almost rather die for his trouble than admit to making a mistake. When Llewleyn comes across the aftermath of a drug deal turned violent, he takes off with a suitcase that contains $2,000,000. After barely escaping the remaining drug dealers (and the scene where Llewelyn is chased by a pit bull is a classic), Llewelyn sends Carla Jeans to stay with her sick mother and then he grabs the suitcase and heads over to the next county. It quickly becomes apparent, to the viewers at least, that Llewelyn has absolutely no idea how to get out of the mess that he’s found himself in. And it’s quite a mess because Anton Chigurh (Javier Bardem) has been hired to track down the money. Perhaps one of the greatest movie villains of all time, Chigurh is an almost unstoppable force of death and destruction. Chigurh pursues Llewelyn across Texas, killing almost everyone who he meets along the way. Interestingly enough, just as Llewelyn continually makes excuses for his own greed, Chigurh also makes excuses for his murderous activities, seeming to obsess over the role of fate and chance. Whereas Llewelyn refuses to give up the suitcase, even though it means that he’s putting his own wife in danger, because he insists that he can figure out a way to keep the money, Chigurh occasionally dodges responsibility for his own actions by flipping a coin and putting the blame on fate. And finally, there’s Sheriff Ed Tom Bell (Tommy Lee Jones), who is both the most decent and the most ineffectual male character to be found in the film. He’s an old-fashioned lawman, the type who, had this film been made in the 50s or the 60s, would have been played by Gary Cooper and would have both vanquished Chigurh and given Llewelyn and Carla Jean marriage advice as well. In the world of No Country For Old Men, however, Ed is almost always one step behind both Chigurh and Llewelyn. Instead of saving the day, Ed spends most of the movie shocked and saddened by the violence around him. As the film draws to its conclusion, he’s left to wonder whether any one man can make a difference. He’s left to literally wonder whether his area of South Texas has truly become no country for old men. I recently rewatched No Country For Old Men on TCM and I was surprised to discover just how well this film holds up, even after repeat viewings. If anything, the film actually improves on repeat viewings. Once you know how the story is going to end (and, in a fashion typical of both the Coens and Cormac McCarthy, No Country For Old Men does not have a traditional ending), it’s easier to see all of the things that you may have been too overwhelmed to appreciate the first time, like Kelley McDonald’s performance as Carla Jean and Stephen Root’s cameo as Chigurh’s shady employer. However, for me, the main reason that I appreciate No Country For Old Men is because it is one of the few films that actually manages to get South Texas right. My mom was born and grew up in South Texas, in the town of Benavides to be exact. I’ve spent a lot of time down there. The portrait that No Country For Old Man paints of South Texas is not always flattering but it is largely accurate. No County For Old Men captures both the region’s terrifying violence and its natural beauty. It’s honest about the fact that there are men like Anton Chigurh but, at the same time, you occasionally meet an Ed Tom Bell as well. And, of course, there’s a Llewelyn Moss in every town. He’s the one who you meet and you hope — often against your better instincts — that he won’t get in over his head. The Academy named No Country For Old Men the best film of 2007. For once, the Academy was right.